This is the best creamy dairy free salad dressing ever! You won’t believe that it is a vegan recipe and has no oil, no egg and no dairy. 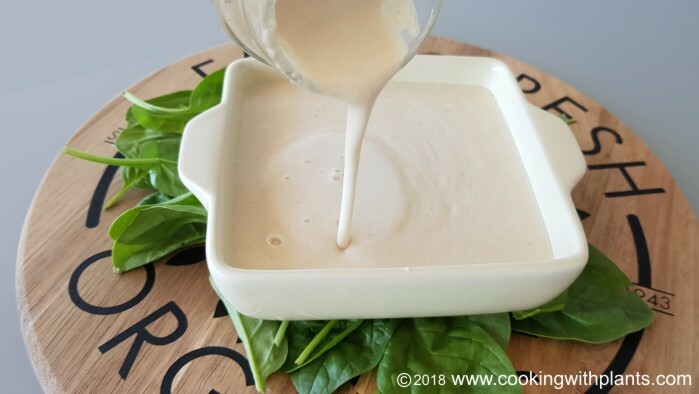 It is a healthy homemade vegan dressing that is so rich and creamy that it will have you craving more. You might even become addicted like me and put it on anything and everything in your fridge and pantry! Hi, good morning from Canada, I am so glad that you are back and this recipe looks amazing. Hi there!!! It’s great to be back and I’m glad you like the look of the recipe. Give it a try… it’s YUM!!! So lovely to see you again Anja. Missed you. Your recipes helped me so much in my oil free/plant based journey. Looking forward to trying this recipe. It looks great! I will try it today. Thank you for all your recipes and the time it takes you to make the videos. Thank you for caring. What are the nutritional values for this dressing? It looks good and I will definitely try to make it. I’m interested in the fats and sodium per serving. Wow, Anja. This dressing is delicious. I’ve made it to take to a Plant Based 101 presentation tomorrow night. Thank you. Anja! So glad to see you again! You have been missed!!! If I’m using this same tribest personal blender as you are, should I soak the nuts or will it blend ok without soaking? Thanks for all your wonderful oil free recipes and for all you do to make going plant based easy! I’m enjoying two of your cookbooks and love how easy the recipes are to make!! It’s a bit bland for me. What might I put in to this to make it taste more lively or more like so,etching I would want to put on a salad? You could try a bit of fresh lemon juice. I made this and added garlic powder, parsley, dill and dried minced onions!!! Yummy! Just made it and love! How long is this good for in the fridge? Made this last night to go over a mango, sweet potato and black bean salad and it was DELICIOUS. Even my fussy hubby really enjoyed it. I am so glad you are back. I have missed visiting your site and making your delicious recipes. I also just watched your video on your new cookbook and it looks fabulous. Thank You for being a great inspiration to me and many others. What blender should be ideal ? My own bleander can’t blend the nuts into liquid not like your blender. Awesome dressing/sauce! I used 1/2 almonds and 1/2 pine nuts, added 1T lemon juice plus 1 clove of minced garlic. Great base for many other sauces. Thanks so much! You could try some almond or cashew cream. Looks delicious! !Cant wait to try it. Thank you so much Linda… and so glad you like the recipes and videos. Welcome to the lifestyle!